I didn’t know Levi as a friend I knew him as a mentor. He was always Nossons big brother. The captivating head counselor, the guy who could make you laugh until you couldn’t breathe. I remember arriving on my first day of camp scared, and feeling lost away from home. If your first camp experience is not terrifying enough, head-counselors have a tendency to make it a nightmare. They’re these big guys who are constantly hoarse from screaming, they have an eternal evil smirk which every child dreads. I remember thinking that they could read my most secreted thoughts when they looked at me. Even if you knew that you were doing everything you were supposed to, you always double checked when they were around. Every kid’s nightmare is his first day of camp. I remember Nosson warning me to stay calm when the head-counselors started their mischievous screaming, threatening and warnings. Those bully head-counselors would yell at us until we really regretted ever coming to camp at all! It’s a frightening experience of which every kid has to go through on his first day of overnight camp. For me it was a fragile moment, it struck cords at my heart and made me wonder if bullying and commanding was inevitable with receiving authority. That day would have been my disaster if not for Levi. I remember him standing on the side smiling throughout the ordeal, while the other head counselors barked with delight. All He was occupied with was making you laugh and feel comfortable. He didn’t scream, he simply spoke with a high pitched cantoral voice. His smile was perpetual and warm; he made you feel that everything was ok and he was there for you. Over the years I had an occasional chat with him. He always stressed happiness, and with his signature presumptuous personality he was constantly irritating you to the limit with friendly irksome remarks. He was the only person who could humor you with his making fun of you! But he knew his limits and always showed that he truly cared. 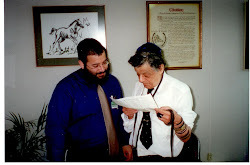 The little that I do know about his Shlichus life is what Nosson told me, and from a short personal firsthand experience which I spent with him in Virginia. He was lively devoted and energetic; anybody who met him felt energy radiating from him. But above all he was altruistic. If something had to be done he did it, no matter what the costs or the nuisance. He thought big and did big, nothing was too big of a deal for him. He cared solely for another, he completely ignored his personal benefit from the things he did, and complacency was a rejected word from his lingo. If something was troubling someone he helped him through. He was an eccentric in his love for others. Constantly telling me that I must share everything I have with others. My mind now wrestles with these thoughts. Here was a person who was the paradigm of an altruistic existence. Someone whose motive in life was only caring for others. He didn’t help others because it was good for him; he helped others because that was him. Without thinking of a Shliach like Levi my mind would tell me that Morality and kindness is a gesture. It’s something we use to fool others into believing that were doing what’s good for them, but in essence it’s all a pseudo show, we ostensibly only care about ourselves. But when I picture Levi I realize that morality and kindness can be truly altruistic. He honestly cared solely about others, altruistic and selflessness was the first and only important words in his dictionary. He depicted the truth of what Shluchim truly are. I believe that there is a greater plan to it all, I only beg and pray to g-d to let us see in an open and revealed way the truth of this sadness. Let the "Nevuah" of Yeshaya "ומחה ה' דמעה מעל כל פנים” come true speedily in our days.